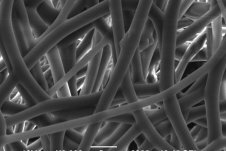 A polymer electrospinning technology developed by Arsenal Medical (Watertown, MA) improves throughput rates of nanofibers so dramatically that the technology is in play for applications involving drug delivery, very tiny sensors, tissue engineering, filters, and self-healing coatings. Barry says that the Arsenal processing technology can increase the manufacturing rates of core-sheath fibers more than 400 fold compared to currently used needle-based electrospinning techniques, which typically operate at flow rates between 1-10 mL/h. The Arsenal system can create several square meters of one millimeter thick core-sheath mesh per day, at least based on a lab scale system. The system is believed to be scalable. Information on the new system was recently presented publicly for the first time at a meeting of The Fiber Society in Boston. The project is funded in part by the U.S. Department of Commerce, National Institute of Standards and Technology’s Technology Innovation Program (TIP). Arsenal calls its fiber technology AxioCore.